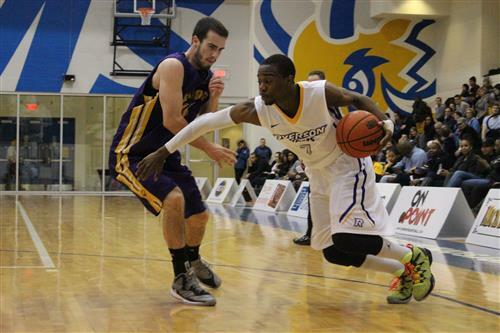 The Ryerson Rams men’s and women’s basketball teams will be playing at the MAC this Saturday in the Ontario University Athletics (OUA) quarter-finals. The women’s team will be facing off against the Ottawa Gee-Gees at 6 p.m. and the men's team will be taking on the Laurier Golden Hawks at 8 p.m. Both teams are hoping to advance in the playoffs as contenders for the Wilson Cup. Ryan Skilton and Alex Lyle will be covering both games. The Golden Hawks seem to be in a rhythm so far. Jahmal Jones draws the foul and will shoot two from the line. Jones hits them both. Rams trail by one point. The second half is about to get underway. Aaron Best with a nice pump-fake, then puts in the jumper to open the second half. 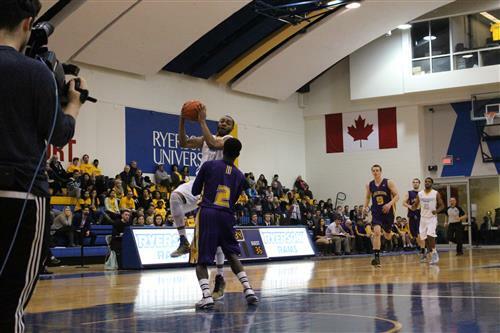 Ryerson leads 51-36. Peter-McNeilly drains the three to give Ryerson a 19-point lead. Aaron Best given an offensive foul, much to the fans' disliking. Rams' coach Roy Rana isn't happy either. 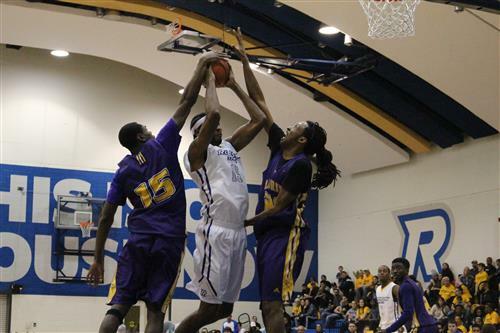 Golden Hawks' Aiddian Walters fouls Green. He will shoot two. Green hits both to give Ryerson a 58-36 lead. Almost three minutes into the second half and Ryerson still hasn't given up a basket. Jones commits his second personal foul. Golden Hawks' Owen Coulthard to the line, shooting three. Coulthard makes all three to draw Laurier to within 18 points. Rams' Jordan Gauthier answers, sinking the basket and drawing a foul. Ryerson seems to be completely shutting down Laurier. Rams now lead 66-41. Rams' Mukama sinks one from downtown. Rams lead 69-46. They're just going in from everywhere for the Rams. Gauthier sinks another three. Rams have a commanding 26-point lead with just over three minutes left in the third quarter. Gauthier gets called for the foul and elbowed in the chest. That can't be a good feeling. Peter-McNeilly hits the three to give the Rams a 28-point lead. With the Rams leading by 30, this is looking more and more like a blowout — something Ryerson is used to. The Rams have yet to play a game 10 points or closer. Jahmal Jones with the buzzer beater. Heading into the fourth quarter, Ryerson leads 83-50. Rams' Juwon Grannum kicks the quarter off with a bang, draining the basket and drawing the foul. At this point, it appears as though Laurier is just trying to hang in there. They look exhausted. Aaron Best was called for an offensive foul on this play. Laurier's offence seems very disorganized tonight. It hasn't looked in synch all game. Jones sinks one from downtown to add to his team-leading 23 points. Jahmal Jones and Aaron Best have been taken out for what appears to be the rest of the game. A wise choice on Roy Rana's part as the Rams have a commanding 42-point lead with five minutes to go.